Sorry for the long wait! Check out part 1 here if you haven’t checked it out! 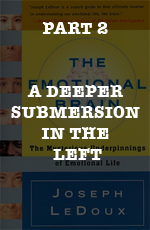 Here in part two I would like to integrate what we learned about “the emotional brain submerged in the left” with some political strategies and outlines for organizing and reorganizing our leftist community. I will draw largely from Paulo Freire’s Pedagogy of the Oppressed, which I find to be full of insightful and intuitive criticisms and proposals for our fractured political landscape. In the previous part, I wrote largely about how our brain’s emotional mechanisms give rise to our basic political program and how our emotions can manifest themselves in the form of sectarianism or other unproductive political practices. Here, we will flesh out in depth many of the processes we briefly touched on in part one while also criticizing and supplementing some of Freire’s theories and observations with some neuropolitical dialectics. Paulo Freire dedicated decades of his life to working with oppressed workers, educating and learning from them. His book is largely the fruit of the knowledge he acquired in investigating, as the title implies, the pedagogy of the oppressed. In it, he dissects the strategies of education that characterize the oppressive ruling class and the fractured political parties of his time. In doing so he counterposes a pedagogy that is truly revolutionary. Freire’s insights stemmed from decades of research through observation and interaction with the oppressed class in Brazil. He shares a collection of tendencies which reflect class distinctions that capitalist societies implant in the minds of the oppressed and oppressors. I stress that these are tendencies rather than scientifically concrete and proven data. Again, this is not a shortcoming of his work, it is merely an objective assessment of the resources available to him at the time. With what we know about the emotional brain, I will provide an emotional neuroscientific framework which further legitimizes the intuitive tendencies Freire discovered. I hope this adds another dimension to an already phenomenal work. Freire begins is book by establishing his humanist understanding of humanity. Indeed, humanization is the people’s vocation. As a reader of this blog, you (hopefully) feel this desire to further humanize society. Freire insightfully states that even the negation of efforts of humanization affirms that humanization is the people’s vocation. This is a dialectical fact which Marx and Engels embraced and built upon in their work. Dehumanization is the suppression of otherwise revolutionary forces. It is the effort to retard growth, to oppress those who desire humanization. Dehumanization is the force a ruling class employs to oppress another. But if this is so plain and true, why are some of us on the side of humanization and others on the side of dehumanization? This is the first point I’d like to discuss. I believe the answer lies in every individual’s personal development. What constitutes a ‘seat of consciousness’ and how does that differ from a ‘worldview?’ A seat of consciousness represents all environmental experiences, including how a particular person processes them. All contributing factors such as one’s family, nationality, gender, race, religious upbringing, education, and the like are encapsulated in this term. Ultimately, one’s seat of consciousness embodies the information needed to understand why an individual, at any particular point in time, chooses a certain political rationale (program, worldview, etc.) and expresses it. This term represents the unique perspective of an individual who interprets the experiences he or she has had, is having, and will have. A person’s seat of consciousness changes as each experience emotionally affirms or denies one’s accumulated understanding of the world. It is not permanent. On the contrary, it is marvelously plastic and fluid. Rather than approaching a person’s opinions as indicative of an abstract “worldview” which somehow represents a specific type of thinking that a definable population uniformly subscribes to, we root one’s unique perspective in a simple material fact; that all humans have a starkly individual life with a rich private history—a fabric of memories and subjectivity inextricably woven together. It is this that constitutes an individual’s seat of consciousness. It is this “thematic universe” that an individual’s seat of consciousness is born out of and ultimately navigates, deconstructing each theme with every tool available. In each system ruled by a class of oppressors there is a goal of purging attitudes of rebellion from the minds of the oppressed. Under imperialism there is a plethora of tactics with the ultimate purpose of political assimilation to the oppressor’s rule. The oppressor’s seat of consciousness is forged in luxurious capital, towering above the oppressed. In realizing who and what this political struggle is against, we must consider how to fight this battle. How this battle takes place is a topic where our unity as the oppressed disintegrates, dropping us into the cesspool of sectarianism. It is here that we see hierarchy develop in political parties, centralized around a party’s program. In looking to further their political development, people join organizations seeking knowledge, comrades, and tools for fighting oppression. It is in this emotionally affirming environment that an individual begins to cement their viewpoint once more; yet still not from themselves, but from a seat prescribed to them. At the top of these hierarchical organizations, a seat of consciousness is decided for the entire group to represent and adopt. As I referred to in part 1, sectarianism stems from these organizational methods which callouses individuals from being able to effectively discuss their abstract political differences in fruitful dialogues. The vanguard party, by engaging in democratic centralism, becomes a doctrine designed specifically to blind outsiders to a party member’s individual seat of consciousness. This is done in order to keep outsiders focused on the party’s program, which is a grave and serious obstacle to healthy dialogue. Other organizations utilize reactionary emotional tricks designed to arouse feelings of disgust and intolerance before discussion can be had. Red baiting is one of these tricks which has often been deployed at a moment’s notice. With this said, what organizational methods are healthy? This will be the topic of part 3.